Cotton thread is produced from large cotton bales that are cleaned, combed, carded, twisted, and spun. Polyester thread is derived from petroleum that has gone through a cracking process. During the cracking process, crude oil is broken down into a number of components that will be processed into a range of products from gasoline to plastics including polyester. Xylene, a hydrocarbon compound, is generated during cracking. Nitric acid and glycol are added to modify the xylene by a series of chemical reactions. The fluid is heated and condensed in an autoclave, and the molecules align to form long molecules called polyester. The resulting mass is extruded, cooled with water, and cut into chips. These chips are shipped from the refinery to the thread manufacturer for spinning. Engineers who design sewing thread are called seam engineers. They are experienced in the practical aspects of sewing, sewing machine operation, and clothing manufacture. When a new sewing thread is designed, the needs of the specific market are analyzed carefully, and a prototype thread is produced and tested under actual use conditions. The best thread products are needed to meet the demands of new and everchanging markets. 1 Cocoons containing the pupas are heated with air to keep the pupas inside. 2 The cocoons are immersed in water and a brushing motion unwraps the silk thread; a single thread can be up to 1,000 yd (3,000 m) long. 3 Several threads from the same cocoon are wound together in long loops or hanks to produce a single yarn. Three of these single yarns are twisted to produce nett silk thread. More than three single yarns can be used depending on the planned use of the thread. 4 Schappe silk is made from cocoons from which the silk moths have hatched. This matured material is tougher than nett silk cocoons and must be softened, washed, and dried. 5 The cocoons are passed through steel rollers with combs to produce bundles of long, straight fibers of silk called combed top or peigné. 6 Several bundles are grouped together to form a band that is also combed into a narrower band and fed through rotating rollers. The emerging yarn is slightly twisted and is called the roving. 7 The roving is spun to form a single thread, and several single threads are wound together, twisted, and fed onto a bobbin or cone. 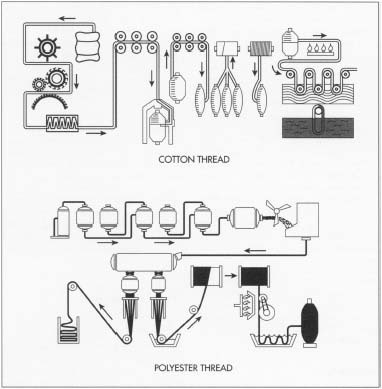 8 Cleaned, combed, and sorted cotton is fed through a series of rollers in a process called drawing that generates a narrow band of cotton fiber. 9 The fiber is slightly twisted to form roving, and the roving is drawn and twisted again. 10 It is spun to form a single thread that is wound and twisted with others to form the thread. 11 Cotton thread is singed over an open flame and mercerized by immersion in caustic soda. These processes strengthen the thread and give it a lustrous finish. The treated cotton thread is wound on bobbins or cones. 12 The chips of polyester received from the refinery are spun into long filaments that are banded together to form polyester tow. Tow contains more than 170,000 continuous, fine, parallel filaments in a long band. 13 The tow is stretched to the breaking point so that weaknesses in the filaments are exposed. The weak points are cut out, and fibers that are 2.5-4.75 in (60-120 mm) are produced. 14 These resulting strong fibers are banded together again in parallel, and several bands are combined until a narrow, even, high-quality band of parallel fibers results. 15 These bands are further stretched and slightly twisted into roving, and the roving is spun and twisted into single thread. The drawing and twisting process stretches the fibers up to 10-20 times their length in the tow stage, and the spindles on the spinning machines that do this work turn at 12,000 revolutions per minute. All types of thread may be finished in similar ways. 16 After manufacture, the thread is dyed. Dye is mixed in large vats; several hundred colors can be produced, and dye mixing is controlled by computer. Large cones or bobbins of manufactured thread are lowered into pressurized vessels, and the dye (and other additives) are released into the vessels by computer. After it is removed from the dyeing vessel, the thread is dried for 24 hours. About 6.6 tons (6 metric tons) of thread can be dyed in one day; this equals 66 million yd (200 million m) of sewing thread or enough to circle the equator five times. 17 The dyed thread is wound on smaller spools for industrial or home use, and the spools are packed into boxes for shipment. Optical devices monitor the spool winding and packing processes. Thread must emerge from the factory with a great combination of performance characteristics. 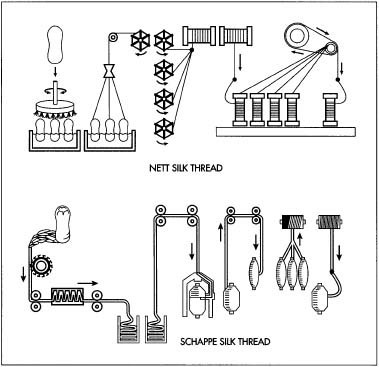 During its lifetime, thread will be passed through a number of metal guides on a sewing machine, held in tension by the sewing machine needle and subjected to its action, bent into position from the bobbin to interlock with the thread from the needle, stretched and abraded when the garment is worn, and laundered or dry cleaned many times. Thread functions not only to clothe but to protect us. We count on the thread in products like shoes and automobile safety belts to protect us throughout the life of the product. In the future, the manufacture of thread must continue to adapt to new types of fabric and clothing design and production. Futurists may predict that clothing and its varieties will become obsolete; however, the reality is that the consumer wants to express personality through a closet filled with clothing for a variety of activities. And this clothing is sewn together with specialized threads. Cream, Penelope, ed. The Complete Book of Sewing. New York: DK Publishing, Inc., 1996. Hollen, Norma and Jane Saddler. Textiles. New York: The Macmillan Company, 1968. Tortora, Phyllis G. Understanding Textiles. New York: The Macmillan Company, 1992. Coats & Clarke, North America. http://www.coats.com . Synthetic Thread Company. http://www.syntheticthread.com .